The hall committee runs ten Belli Country Dances each year. Doors open at 7.30pm for an 8 O’clock start. The dances are alcohol free and have become very popular in recent years with an average of about eighty people attending each dance night. 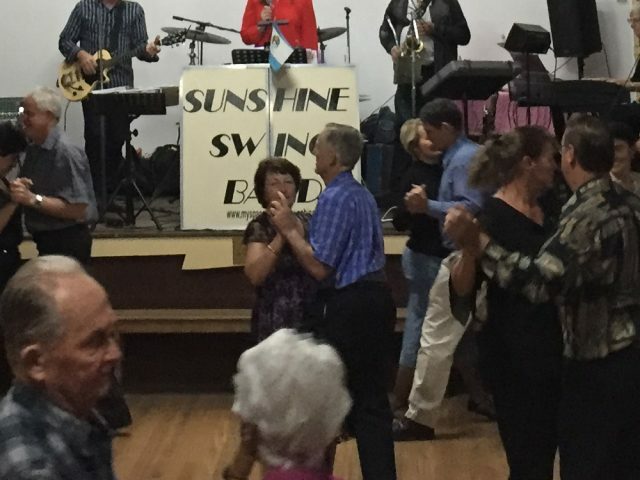 People come from as far afield as Mundubbera, Kingaroy, Gympie, Maleny, Caloundra and Glasshouse Mountains as well as the Mary Valley and the Sunshine Coast to enjoy a great night of old time country dancing. The main attraction at our dances is the live music supplied by the very popular five piece ‘Sunshine Swing’ band. The dance program features many of the old time favourites people have danced for years. These include Gypsy Tap, Evening Three Step, Swing Waltz, Maxina, Pride of Erin, Merrilyn, Log Cabin, Parma Waltz ,Canberra Two Step, Oxford Waltz, Jive, Foxtrot and Barn Dance. If children are present the band includes either a Hokey Pokey, a Chicken Dance or the Mackarena. A scrumptious supper is provided at half time. Admission to the dances is $14 per adult and $5 for students. Children fifteen years and younger are admitted free of charge. The doors open at 7.30pm and the dance program starts at 8.00pm with the ever popular Gypsy Tap. The final dance, the Medley, closes the program at midnight. Experienced dancers are happy to teach/lead people who aren’t familiar with a dance. Dance lessons will be offered during the warmer months if people show an interest. Check out the dance dates and put a night of old time dancing at the Belli Country Dance on your bucket list. Belli Country Dance ………………….. Be In It. If you have any questions or queries,please use the contact us form. © Copyright 2018 - Belli Community Hall.